John Creedy is really good at using complicated maths to make simple points. I’ll summarise the simple points in Creedy’s working paper on sugar taxes, issued earlier this month. Section 2.1 shows that, whenever people enjoy a bundle of goods of various healthiness, and whenever people are likely to shift from one good to another if prices change, any tax on a particular unhealthy good might reduce consumption of that good while increasing consumption of other less healthy goods. Consequently, you can’t just say that a soda tax would improve health – you need to show what the effects are across a broader set of consumption goods. At minimum the you’ll get less than you’d hoped for in terms of effects; it’s even possible to wind up getting worse health outcomes. Sections 2.2 and 2.3 work through the maths to get an equation specifying the necessary conditions for a tax on one calorie-heavy food to yield an increase in total calories consumed. That’s equation 16. Walk it through. Food 1 is taxed, Food 2 isn’t taxed. An increase in the price of Food 1, presumably through a soda tax, will increase total caloric intake whenever the inequality in Equation 16 holds. It isn’t all that likely to hold, but all of these things would also limit the effectiveness of any tax in reducing calorie intake even if we don’t get a full reversal from the intended effect. The first term in the equation is the cross-price elasticity of Food 2 with respect to Food 1. How much does consumption of Food 2 go up if the price of Food 1 increases? So imagine Food 1 is soda with a soda tax and Food 2 is chocolate bars. If the price of soda goes up by 20%*, by how much does consumption of chocolate bars go up? Suppose that chocolate consumption goes up by 5% with a 10% increase in the price of soda. That cross-price elasticity would then be 0.5. On the other side of the inequality we have another set of terms. The first of those is the absolute value of soda’s own-price elasticity. Why absolute value? Because own-price elasticity is negative (consumption drops when price goes up). The second is the ratio of the calories in soda as compared to chocolate. The third is the ratio of budget shares spent on soda as compared to chocolate. And, finally, the last is the price of chocolate divided by the price of soda. So what’s needed for the soda tax to actually increase calorie intake? The more calories per unit in chocolate bars as compared to soda, the more likely we are to have perverse effects. And even if you don’t wind up in the case where the soda tax increases calorie intake, you still get less calorie reduction than you’d have expected whenever the three points above are more important. I love John’s work, but it is pretty tough to read through it unless you know the maths. I don’t think he deliberately writes these things to exclude people who can’t understand the maths, but it’s pretty hard for anybody who doesn’t follow the maths to read. If the government wanted to push a strategic anti-sugar-tax report in an election year, it wouldn’t have had John Creedy write it. Like, just look at this summary he provides of his illustrative example. And do note that the text below the graph is about as layperson-friendly as John gets. Does this look like a political document? I wonder what has to be going on in your head if you think that John Creedy is part of some big government conspiracy to write heavily mathy things that maybe one in a thousand people can read. The public health people then use John’s equations to show that it isn’t particularly likely that we get an increase in total calorie consumption with a soda tax, but that’s not the main point in there. The main point in there is how the effectiveness of any soda tax drops with the combination of things listed in my three bullet point summary. And as for any alternative theory that would have “Oh, they’re writing this up so that people like Crampton can use it in arguing against sugar taxes”, well, I didn’t even see the point in blogging this piece until they mentioned it. It seemed way too impenetrable even to try blogging about. I’d be a bit surprised if anybody were even still reading this post by now after the maths above. I did tweet about the report when it came out, mostly because I was exceptionally proud that The Initiative’s Jenesa Jeram’s work on soda taxes was cited by one of New Zealand’s gods of empirical public finance (see footnote 2!). The other fun bit in the public health people’s blog post: they have a big summary of all the not-economists who agree with them about taxes, but continue to ignore Waikato University Professor of Economics John Gibson’s work. But that doesn’t mean you have to ignore it. He’s giving a talk in Auckland on it that I’d be attending if I were in Auckland. He shows how the estimates of the effects of soda taxes in Mexico are overestimated because consumers shifted to cheaper sodas and, consequently, reduced their soda consumption by maybe a third as much as is often suggested. And note that John’s work on soda taxes is funded through the Royal Society’s Marsden Fund, so it’s harder for the public health types to simply dismiss on the basis of its funding. * Note: only an idiot would think that this does not apply to excise just because I used the percent sign and excise is done per unit of whatever rather than in percent terms. Elasticities are just done in terms of percentages. You can turn any excise into a percentage change around different price thresholds to get point elasticities. 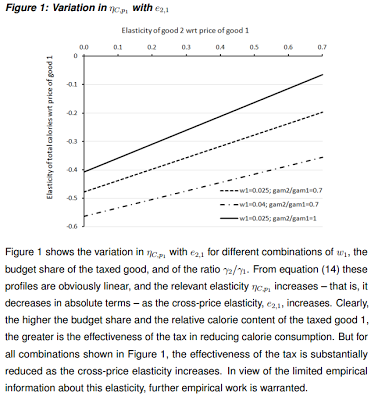 The effect of any per-unit excise depends on price elasticity. You can probably judge whether somebody gets to count as an economist based on whether they get this. Getting it isn’t sufficient for being an economist, but it’s necessary. Numerous modelling studies have demonstrated health gains from a sugar-sweetened beverage (SSB) tax – including a recent study in the journal PLoS Medicine by some of us. Modelling does not demonstrate health gains. Health gains demonstrate that. Modelling helps predict those, but predictions and reality are not the same thing, and never will be.